When does modern become modern? This Berkshire retreat began its modern life in the 70s and was partially renovated in the 90s, leaving it with a bit of an identity crisis. The owners’ suite was our first challenge; we removed dark rose plumbing fixtures arranged poorly for function. 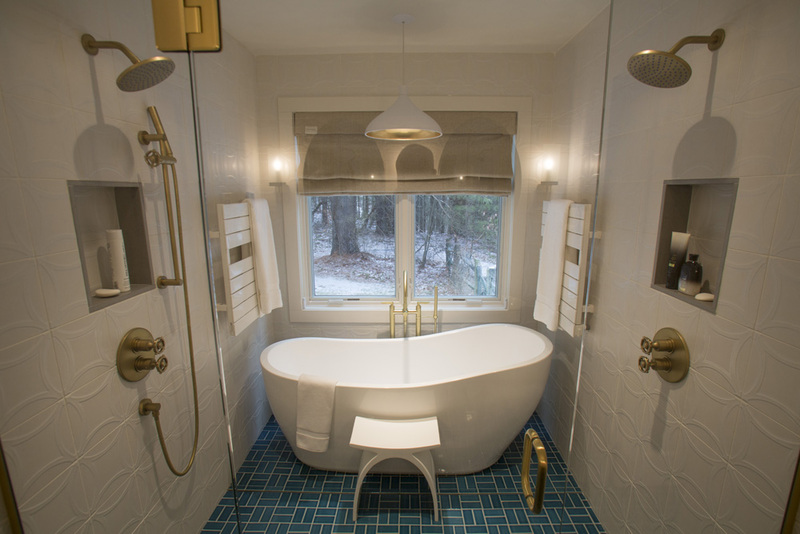 The space now features dimensional wall tile, natural brass plumbing fixtures, a wet room concept with his and her showers, a modern free standing tub, and a basket weave teal tile floor that suggests stepping into a Berkshire pond. The sink vanity in this master bathroom was designed by Karen Beckwith Creative and custom made. The tile pattern layout was artfully engineered with the plumbing layout by Karen Beckwith Creative. The view into the toilet room features fine art photography by Scott Barrow.